The 1953-54 Buick Skylark was GM's first post WW II attempt at a Personal Luxury Car. It was Ford who first capitalized on a personal luxury car for the masses—before that GM had dabbled in the market with the Buick Skylark of 1953-'54 and the Oldsmobile Starfire of 1954. Of course, Cadillac had been producing the Eldorado, but all three were up in the price stratosphere, and few—even affluent middle-class families—could afford or aspire to those cars. Chrysler built a few Ghia-designed upscale sport-luxury pieces, but the numbers were so low and the prices so high that only Arab sheiks and Hollywood stars could afford them. The Thunderbird four-seater changed all that in 1958. Suddenly many people could afford a stylish, custom-looking job that always turned heads. GM and Chrysler were caught flat-footed, and when the sales figures came in, they were stunned. Thirty-seven thousand in 1958 and Sixty-seven thousand in ’59—these numbers were not the sale of a whimsical semi-show car, but rather those of a solid marketplace winner. Chrysler stood on its 300 letter series cars, and would later offer a lower-priced version, but otherwise offered high performance mid-sized cars like the Plymouth Fury and DeSoto Adventurer as alternatives. Frankly, Chrysler never quite got it. GM, on the other hand, saw that the market could be sizeable. Early on, it offered up the same solution as Chrysler, cars like the Chevrolet Impala and the Pontiac Bonneville, which people saw as gussied-up versions of those makers' bread-and-butter offerings. Few know this, but the Riviera was originally developed—all the way back in 1958-'59—as a Thunderbird competitor. to be sold by Cadillac, but Cadillac did not want or need a high volume, luxury offering, settling instead on continuing the Eldorado. The concept thus languished. Meanwhile, Buick, Olds, and Pontiac worked on similar ideas, and all three settled on developing a four-place, sport luxury car based on their short-wheelbase, full-sized lines. Olds and Buick would begin work on a direct Thunderbird competitor, but the cars were a few years away, with the Buick Riviera seeing the light in 1963 and the Olds Toronado not until 1966, ostensibly due, in the case of the latter, to the extended development period required for front wheel drive. So the idea of personalizing and moving upscale with what was seen as a stopgap approach went forward. The surprise was that it was Oldsmobile who made it to market first with the 1961 Starfire. Perhaps this was because GM saw the car as a test, but more likely it was that Olds met its deadlines more quickly. Buick and Pontiac would follow in 1962 with the Wildcat and Grand Prix, respectively, and soon all three would occupy a niche just below Chrysler’s 300 letter series cars. But why were these cars perceived as different from cars like the Impala and Bonneville? First, they were styled with just enough differences that they seemed separate from their brand's regular offerings. Second, they offered interiors that were very luxurious and personal, with few options. Third, production was kept low to add to the cars' exclusivity. This would change once the models were established, but even then, they were never intended to be high-volume models. The 1961 Starfire was offered only as a convertible and was intended to be a 7,500 unit maximum. The car was so successful that 7,800 were actually sold. The next year, both a hardtop and convertible were made available, and production soared to almost 42,000 units. Starfire was now established. In 1962 the Wildcat bowed. Opposite the Starfire, it was introduced mid-year as a two-door hardtop. Basically, it was an Invicta with more distinctive trim and interior, and 2,000 were sold. Buick made an interesting decision, knowing that in 1963 the Riviera would bow, and that was to expand the line to two and four-door hardtops and a convertible. The 1963 Wildcat would become the Pontiac Bonneville equivalent and soon became just another gussied up, full-size car that, by 1965, would be on the same chassis as the Electra! The Grand Prix, on the other hand, would stay true to the concept and remain around for the longest period. It would always be a personal luxury coupe (with the exception being 1967, when a convertible was offered) based on the shorter-wheelbase full-size car. In fact, in 1969, it moved downstream and had its own chassis—actually a lengthened, mid-size car frame, where it would stay until Pontiac’s demise in 2008. In effect, in 1969, the Grand Prix would come closer to the concept that Riviera and Toronado espoused, but at a more reasonable price. It paid off with sales exceeding 112,000 in the first year of this new body style! But at introduction in 1962, Pontiac made the Grand Prix capable of tremendous performance by offering all of the Pontiac high-performance engines. The standard engine was the Bonneville's 303 hp 389 CID V8 with four-barrel carburetor and dual exhausts. Optional were a 389 Tri-Power with three two-barrel carburetors, a 318 hp and two higher-output 389s, including a four-barrel version rated 333 hp and 348 hp Tri-Power. A "street" version of the 421 CID engine was also offered. It was primarily the NASCAR racing engine that had been offered in 1961 and available in 1962, only in four-barrel form and rated at 320 hp. Back in Lansing, Oldsmobile was following the Thunderbird practice of offering only its highest output engine, albeit with a pinch more horsepower than the standard version offered in the Ninety-Eight. A longer-duration camshaft and a bit more compression eked out 20 more hp in 1961, and would continue at the same rate for the life of the 394 CID motor. The same powerplant would be available as an option on other large size Oldsmobiles for 1963 and 1964. For 1965 and 1966—the latter the Starfire’s last year—the 425 was also hopped up with a hot cam, but it was designed more for torque than horsepower, though the 375 hp figure was quite impressive. By 1967, the Buick and Olds versions were replaced in the market by their respective direct competitors to Thunderbird. Ford, in a surprise move in 1967, offered four-door and two-door variants, something Riviera and Toronado never emulated. So what were the Wildcat, Starfire, and Grand Prix to the marketplace? Were they stopgaps, experiments, or niche cars truly designed for a specific market? Well, they were some of each. Pontiac surely proved that a lower-priced personal luxury car had a market, surviving far beyond Riviera and Toronado. Starfire established a solid position for Olds on the personal luxury car scene and was dropped only so as not to compete with Toronado. Wildcat may be the only one of the three that can truly be considered a stopgap car. By replacing the Invicta name and stressing a performance image, it stayed around through 1970. Chrysler stood pat with its 300 Letter series cars. The first new foray into personal luxury - and seen as a competitor to the Thunderbird - was the 1961 Starfire. 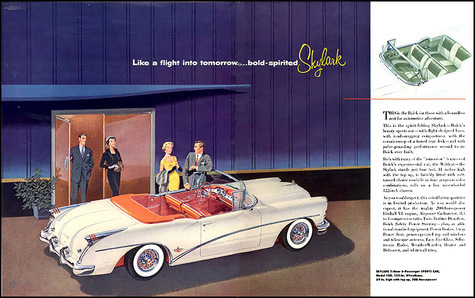 Buick soon followed suit with the Wildcat. In retrospect, it was a stopgap measure - soon to be replaced by the Riviera. The Riviera became the direct competitor to the Thunderbird - finally - in 1963.